RUSH: GQ magazine. How many of you in this audience read GQ magazine? I doubt that many of you do. Gentlemen’s Quarterly, very little about gentlemen in this magazine. It’s just a strict, far-left rag that is disguised as a fashion magazine for sophisticated and elite men. Anyway, they have named their citizen of the year, GQ. Do you know who it is? (interruption) How do you know? If you don’t read GQ, how do you know this? It was on the news. It was on the news. By the way, speaking of on the news, have you heard — there’s this big back-and-forth between Jerry Jones, the Dallas Cowboys, and Roger Goodell, and it looks like Jones is trying to sabotage Goodell’s contract renewal. And, well, shouldn’t count Jerry Jones out prematurely. But one of the things that’s leaked, a couple of supposedly wired NFL insiders at ESPN, Chris Mortensen and Adam — ah, whatever — they reported that Goodell has demands that we haven’t heard before. Goodell’s demanding an average over the length of the term of the contract, 49 and a half — a 50 million-dollar salary, plus health insurance for the family, plus the lifetime use of a private jet. And, honestly, folks, when I see this, “Wait a minute. If you’re gonna earn 50, isn’t that enough to buy your family health insurance? And isn’t that enough to go out and make a deal to have a jet?” I mean, there are any number of companies you can do this with. You can do it with a company called Wheels Up, you can go NetJets. There’s any number of ways that you can have access to a private jet every day without actually owning one. I mean, the kind of jet that Goodell would want would cost 50 or $60 million, but he could get access to one without anywhere near that kind of money. But of course this is not how the elites do it. The elites never use their own money for anything. Remember Jack Welch? Love Jack Welch. Jack Welch is a great guy. He was the CEO of GE for the longest time, and when he was the CEO of GE they had a deal with Boeing where they converted the Boeing 737 to what was called a Boeing Business Jet. And it looked a little different. It was a Boeing 737 but it had a sky-high rear tail fin. I mean, this thing, you look at it and you think it’s a deformed airplane. It’s much higher. And of course the designers design it that way on purpose. But it is how you distinguish between a normal 737 and BBJ. And those things are $75 million. I mean, they’re not cheap, 60 to 75. It’s a Boeing 737. So Jack Welch, when he retired from GE, wanted the use of one of those for the rest of his life, and Boston Red Sox season tickets. Oh, and a company apartment on Columbus Circle in Manhattan. What are you gonna use the $75 million for? Answer: Nothing. (laughing) That’s sweet music if you can play it. Anyway, GQ, Gentleman’s Quarterly, Citizen of the Year none other than — dadelut dadelut dadelut dadelut dadelut — Colin Kaepernick. So the Citizen of the Year wears Fidel Castro T-shirts and Che Guevara T-shirts. The GQ Citizen of the Year wears socks that depict police as pigs on them. The GQ Citizen of the Year proudly announced that he does not vote. And the GQ Citizen of the Year takes a knee during the playing of the national anthem because he says he cannot salute and honor a flag or country in which the cops target and murder people of color. That’s the GQ Citizen of the Year. RUSH: I want to grab a phone call quickly here because all it took was one mention of the rumor about Roger Goodell’s contract and the phones are ringing off the hook here about the NFL. So we’re gonna start in Harrisburg, Pennsylvania. Dave, what’s happening? What’s up? CALLER: Hi, Rush. College professor dittos. RUSH: Thank you. You’re a college professor? RUSH: Wow. I mean, you’re conservative, obviously? RUSH: You’re a rare, rare breed. RUSH: Well, that’s very courageous of you to admit this publicly. CALLER: (chuckling) Hey, I had a quick question for you on the NFL. The latest controversy that popped up I guess thundershowers after Richard Sherman got injured and everybody freaked out, everybody’s talking now about the Thursday Night Football is unfair because it doesn’t give teams that play on Sunday enough recovery time. CALLER: I was curious as to your take on that. Has that controversy been around for a while, or is that something new, just kind of the latest of all the attacks? RUSH: It’s a great question. It actually hasn’t. It’s only in the last couple of years that the injury aspect and ratings decline aspect of Thursday Night Football have been mentioned. RUSH: Thursday Night Football has been a staple of football for years, just not every Thursday. I can remember during the eighties and nineties you’d have two or three of them a year, usually when the World Series and the NFL did not go up against each other. The NFL would move a game that they were having later in the season to a Thursday night game. The Steelers played a bunch of them against the Houston Oilers and San Diego Chargers, I remember. Nobody complained about ’em when they were once or twice, maybe three times a year. Those are symptoms. Thursday Night Football has been amazingly popular in the past with none of these concerns. I think these concerns are just being voiced now because there’s so much trouble throughout the league that the league is looking for what they believe are plausible explanations for the problems. The NFL’s like anything else. It’s cyclical. Injuries are cyclical. Injuries to stars are cyclical. Ratings go up and down — although this is the second year in a row that ratings have been down, and that is unusual. The NFL was on a solid growth rate for over a decade, until last season when they first chalked it up to the election. Now they’re chalking it up to, “Well, too many injuries; stars are not playing,” and Thursday Night Football and, “That’s why there’s so many injuries, and that’s why players don’t have time to recover. That’s why the games are no good.” It’s not that the games are no good. It’s the schedule is no good. There just are fewer compelling teams to watch this year, and that’s cyclical too. You know, every season is a roll of the dice. But I don’t believe… You know, when the NFL was roaring and when it was at the top of the heap, and when it was just steamrolling and there weren’t any negatives about it at all to speak of, compared to now, nobody complained about Thursday nights except occasionally the players from the standpoint that it’s really, really tough to recover. But each Thursday night team gets the next Sunday off. So it’s like a second bye week, and they all get one. So I think all of this stuff is situational. I think if the league were going great guns, if there weren’t any controversies, if the attendance was up and TV revenue was up and everything else the same — the injuries — you would hear so much negativism about Thursday Night Football. But it’s all cyclical and it’s all reactionary and very little of the criticism would stand the test of time. I’m not watching much of the NFL this year. 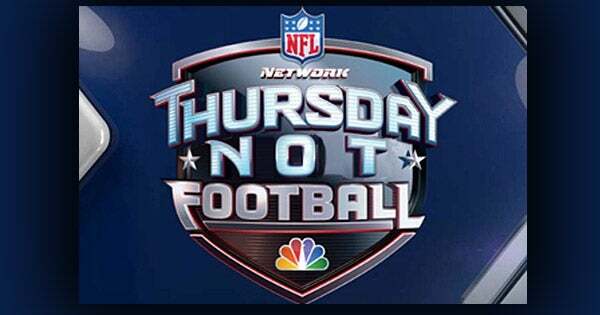 But back in the years I did, I was happy there was a Thursday Night Football in the NFL. I loved it! The more, the better. I’m not of the opinion that Thursday is too much football. I have different reasons for not having much interest in it or watching it as much. I think these excuses are born of panic and situational crisis and that they will eventually go away. I can tell you this: That nothing’s gonna change. I mean, they’re not gonna get rid of Thursday nights because there’s too much money and they’re already losing money now. They’re not gonna throw away that revenue source. It’s network TV money. It’s additional advertising money. They’re not gonna throw it away. They might modify it by trying to cancel some of them and not having quite as many, but that’s been gonna be tough to do as well. They’re just gonna have to weather the storm. I appreciate the call. Where are we headed next? That would be Mark in Freeland, Pennsylvania. Mark, how are you doing, sir? CALLER: Pretty good, Rush. Yeah, I’m retired Navy, and I was thinking about this boycott over the weekend of the NFL. I started thinking that the NFL the way it currently exists is downhill, and it’s never gonna be what it was. So I was thinking that if and when they scrap this league, finally, they should come up with a new one based on the military, called maybe the American Heroes League or the Patriots League — and the teams, the matchups could be like the Philadelphia Phalanx against the Denver Drones or the Detroit Delta Force against the Kansas City Commandos. RUSH: (laughing) I think we got a ways to go before we get there. Even though revenue is down, the league is still rolling in money, and they’re gonna play it out for as long as they can and try to withstand whatever these storms are that they do believe are seasonal and cyclical. In that instance, they’re missing something that’s going on here. Just like the left cannot figure out why Trump won — and, you know, there was another story. What was it? I think Politico went to Johnstown, Pennsylvania, and they went out and tried to find Trump voters. The media is desperate to find Trump voters who have abandoned him or who want to abandon him or are thinking about — and they can’t! No matter where they send reporters, they can’t find Trump voters that are in any way unhappy with Trump right now. But they’re not gonna stop trying to find ’em, and they do their best to mock these people and laugh at ’em, many of you ’em. They put words in their mouths and this kind of thing, and make ’em look like absolute hayseeds. There’s a bit of this same kind of thinking going on in the NFL. The denial of why they’re in trouble, the denial of why there’s less interest in the game, the denial of why fewer and fewer people are attending and watching on TV. They come up Thursday Night Football. That is not why ratings are down. Thursday Night Football and the lack of time for players to recover is not why fewer and fewer people are attending games and patronizing sponsors. That’s a dangerous attitude to have. You know, sponsors and fans pay the freight here. They are the golden goose, and a cavalier attitude about people willing to invest their businesses in this league and in this business is a bit shortsighted, if you ask me. Okay, maybe one sponsor, Papa John, flying the coop, but what if two or three more do and four or five more, what if they’re not replaced? It begins to add up. And it would seem to me that within this universe there ought to be a sense of either recognition, respect, or importance for everybody that’s involved in this league being wealthy and helping it grow or maintain its current status. I just think there’s a whole lot of denial in this league, a cavalier attitude about what their real problems are. Because their real problems are political, because they have politicized this league, and so that’s where the problems reside. And they just refuse to take that seriously or deal with it seriously. I appreciate the call, Mark. We will take a brief time-out and come back. Trump with a fabulously funny tweet about Kim Jong-un. And, folks, there is the beginnings here of a major contretemps between Trump and the intelligence agencies, and especially some former Obama intel people, that’s quite interesting. RUSH: Yeah, yeah. I didn’t watch the football game last night. I got an email from a buddy who said, “You won’t believe what they’re doing at halftime in the NFL game tonight.” And I said, “What?” “They’re interviewing Biden.” Matt Lauer is interviewing Biden. I said, “What? We only interview political people at the Super Bowl.” And he wrote back, “Yeah, well, Biden’s book is out.” I think it’s a preview of Biden’s interview that’s gonna run I guess today, maybe tomorrow on the Today show conducted by Matt Lauer. But I thought, “Are you kidding me? They’re gonna put Joe Biden in the halftime of an NFL football game?” I’m asking, “Do these people not know?” I mean, this is NBC deciding to do this. They don’t need to clear it with the NFL. Maybe they did; I don’t know. But of all people, Joe Biden? Look, he’s a loyal Democrat, and Joe Biden’s best speeches have been covering for Obama at the two conventions. But the guy hasn’t won the Democrat nomination on his own, he’s never going to. The fact that he’s at the top of their heap of the candidates for 2020 and NBC decides to put him at halftime of the Sunday Night Football game, Patriots and you’ve got the Broncos, you can get anybody you want. You could interview Belichick if you could get him. Elway pregame, I’m told. That just blew my mind, especially all he’s got is a book. You’re doing a prepub book interview for Biden on Sunday Night Football? I thought, man, they’re doubling down. It’s almost like they’re trying to learn from Trump but doing it wrong. Whenever Trump, quote, unquote, steps in it and the media has this, “oh, my God,” kind of reaction, Trump doubles down on it. Well, this is almost like the NFL’s, “Oh, you think we’re politicizing this too much? You think there’s too much anti-America protests? Well, here, take this politics.” And then they ram Joe Biden down everybody’s throat at halftime of what apparently was a dull game anyway. It must have been, if Joe Biden was the highlight of the night, that’s gotta be bad.